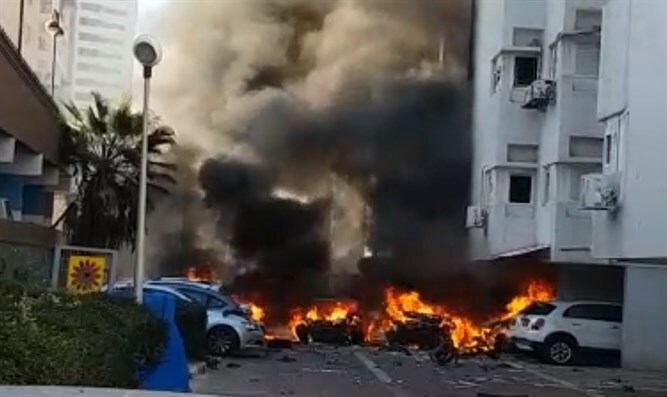 Explosion rocks parking lot under Ashdod apartment building, injuring two and destroying multiple cars. Mafia involvement suspected. An Ashdod parking lot was bombed Monday morning, injuring two and destroying a number of parked cars. The incident took place at approximately 8:30 a.m. in a parking lot underneath a residential building on Kinneret Street in the coastal city of Ashdod, south of Tel Aviv. The explosion, apparently from a car bomb, injured two and destroyed multiple cars in the lot. Police have opened an investigation into the bombing, which may have been an assassination attempt by members of a criminal organization against a rival faction. “Firefighters have extinguished the cars which had caught on fire. Police investigators are probing the circumstances surrounding the incident and are gathering evidence and testimony. United Hatzalah emergency first responder Avi Bahar, who lives near the parking lot targeted in the attack, described the scene of the bombing. "I was with my family outside our home when I heard the explosion. The explosion was followed immediately by billowing smoke rising from in between the buildings. In a matter of seconds, United Hatzalah dispatchers had reported a number of cars on fire on Kinneret Street. I raced over to the building arriving in just a few moments and began treating two people who were injured and lying near the entrance to one of the buildings near the explosion. As I was treating them, other volunteer EMS responders from United Hatzalah's ambucycle unit joined me and assisted in treating the patients who were suffering from abrasions, contusions, and smoke inhalation. The Fire and Rescue Department arrived and began putting out the flames." According to a report by Maariv, the two individuals injured in the bombing both have ties to organized crime syndicates. One of the victims, a 45-year-old man, has been listed in moderate-to-serious condition. The other, 48 years old, is listed in moderate condition. Both have been evacuated to Assuta Hospital in Ashdod.